Someone has been stealing feed out of the feed shed, and Hank knows that it’s his job to do whatever he can to help nab the culprit. 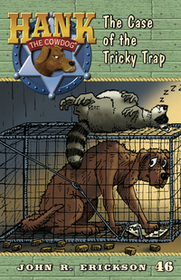 Slim sets a live-animal trap in the shed, and Hank checks it in the middle of the night. Unfortunately, the trap is a little trickier than Hank anticipated, and in the process of his investigation Hank manages to get himself...well...trapped. Can Hank find a way out of this sticky situation?